Sitting there in Sacrament meeting, her finger would move under the words of the hymns we sang so I could follow along. I never could figure out why it jumped down the page at the end of each line. Why didn’t it go to the next line like normal books? I never thought to ask outside of the meeting, and if I spoke to her during the meeting she would usually just give a slight shake of her head that I knew meant she wasn’t going to answer right then. Not during Sacrament Meeting. That was sort of a special, unspoken rule of Sacrament Meeting. But I didn’t feel ignored. Her eyes and hands and arms and smiles were right there with me, even though her voice was silent most of the time. Except during the hymns. I loved hearing that sweet, quiet vibrato sing along. She was not confident about her voice; someone had told her in her youth that she “couldn’t carry a tune in a bucket.” It made no sense to me. I had a good enough ear to know that my Mama never sang off key. I vowed then that all my life I would encourage others like her to sing out with joy. Nobody sings better than my Mama; and to her credit: although she didn’t care to sing for others, she always sang to the Lord—and to me. I vaguely remember her prompting me: “The Church of Je – sus Christ …. of Lat – ter; Day; Saints.” I would repeat it back to her as best I could. When finally I had it right, for many weeks during Sacrament Meeting I would pull her left ear down to me (I never tried to speak to her right, which couldn’t hear; she had trained me on that) and whisper, “The Church of Jesus Christ of Latter-day Saints!” No matter how many times I did it, she beamed as if it were the first time as she barely nodded at me—a cue to be still. One activity I resorted to almost every week was to study Mama’s hands. They were so beautiful. She would laugh when I told her that, and I didn’t understand why. Her nails were pearly white and oval-shaped, from the steel file she kept in her purse. I wished my nails were pretty like hers. I loved to trace the veins on the back of her hands. She said they were work hands. I really, truly thought they were beautiful. Sometimes when I had a hard time waiting for the meeting to get over she would silently pull out her little white lace hanky and roll the two sides from the ends. 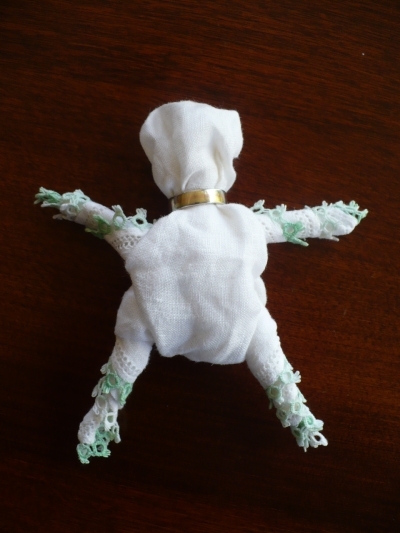 Then she would fold it over and pull out the four corner tips to make arms and legs. To finish it off, she did something unbelievably magical: She put her diamond wedding ring around the little pinched-cotton neck and my Sacrament Meeting Dolly had on jewels fit for a queen. That was the only time she ever took that ring off, that I knew of. Sacrament Meeting had special rules for everything, I think. Sometimes she would play the organ for the meeting. Sometimes I was allowed to sit up there by her in a choir seat behind the organ; but mostly I just sat with the rest of the folks down in the congregation. I loved it while she was playing, and I wanted to be with her when she wasn’t. Once in a while she would stand at the pulpit and say words that came to her right there in the moment. She seemed so reserved most of the time; but when she stood up there she wasn’t shy at all. I didn’t know the word for it then, but in retrospect I would call it: conviction. Mama was transformed when she stood to say what she knew. Sacrament Meeting did wonderful things to people. Lots of lessons happened in Sacrament Meeting; like, you put your knees and your ankles together when you sit. And, keep your skirt pulled over your knees. Don’t turn around in your seat. Don’t put your hands up where you’ll catch others’ attention. Don’t lay down. Listen to the speaker. Don’t whisper and giggle. Do get out your scriptures and follow along. 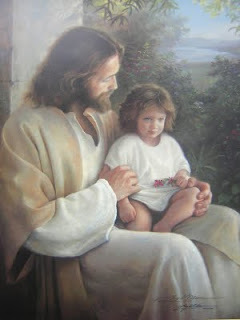 Greg Olsen, "Forever and Ever"
Over time, these list items evolved from hafta’s and dontcha’s to object lessons on modesty, respect, reverence, humility, feasting on the Spirit. I think it was because it was Sacrament Meeting. In fact, I know it was. Sacrament Meeting was different—special. Being told to settle down in Sacrament Meeting always felt like there was something in it for me; it was different than being told to settle down at home, where it was for someone else’s comfort or preference. When I conformed to Mama’s expectations in Sacrament Meeting I felt really good inside. I felt warm and happy and loved. Sacrament Meeting did that to a person. Now when I sit in Sacrament Meeting and my 5 year old asks me in my right ear why my lips move when the priests talk, I explain that it is to help me think about the words. She traces the veins on the back of my hands while I sit with head bowed. I shake my head wordlessly when she speaks to me while the bread and water are passed. I help her sit front-ways, with her skirt pulled over her knees. And sometimes, I stand and use my voice to testify, like my Mama did; and when I return to sit by her, my daughter is all smiles and hugs and I know she feels warm and happy and loved. Sacrament Meeting does that to a person. This entry was posted in In real life, Parenting & Family Life, Sacrament meeting, Sunday School and tagged LDS parenting, love at home, Parenting, parenting help, parenting tips, Rachel DeMille by Rachel DeMille. Bookmark the permalink. Rachel Pinegar DeMille is the happily married mother of eight children. 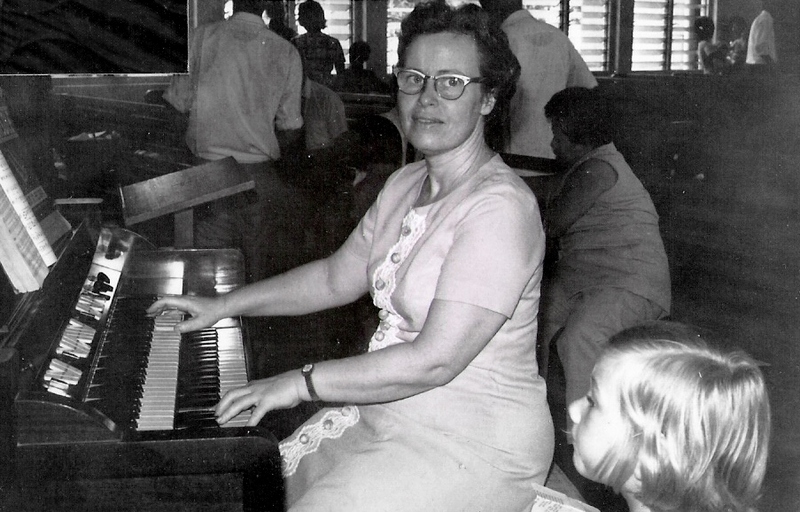 She served a mission to Spain, Barcelona, and has a missionary in Brazil Salvador. A professional writer and educator, she is delighted at the new-found opportunity to share her faith, spiritual ponderings and love of the gospel with fellow Latter-day Saints through The Millennial Star. If I can capture even a tenth part of this for my daughters, I’ll be “well content”. Rachel, such a beautiful and touching post. Thank you for sharing that with us. Welcome to M*! Thanks, SR. Daughters are a treasure. And I find I love my Mama more and more as I watch my 5 grow, and see the lessons she taught me coming down through me to them. I thank the Lord for an angel mother. Thanks, Brian. I have no idea what to expect from this. But I guess I’m up for an adventure. It’s nice that people respond so I get a feel for how my efforts are being received. I appreciate the feedback! Rachel, welcome to M* and for reminding us about reverence during Sacrament. If only my three young boys would sit still during sacrament! I have noticed, however, that they are getting better with time. I remember when my family was young, looking at all those other families with the kids lined up on the pew. How in the world did they get those little ones to sit still? Why am I such a failure? I only had three little ones that were disruptive and fretful; they had [six/seven/nine…] kids, and they are so good in Church! Isn’t it harder with more kids? What a lovely tribute to your Mama! Thank you for showing how reverence is not just sitting quiet, but concentrating on learning with the spirit and keeping Jesus in our thoughts; so hard to do when you worship with children. Your mother did an awesome job of it! Beautifully written! Thank you for sharing!! Thanks for sharing this, Rachel. I think many of us underestimate the influence we are having on our little ones, ALL the time, not just in teaching moments. I know I do. I an re-inspired to teach by example. Thanks for taking the time, Amy! It’s great to see you here. Absolutely Beautiful! After two days of beautiful and uplifting talks, it would seem I couldn’t be lifted any more. But I have been. Thank you!